As it has been said numerous times on this blog, WordPress is a great way to grow your business and get it up and running! Building a website on your own can be a great deal of fun, but the thing that is overlooked the most is website management that comes afterwards, and we know a thing or two about that. Let’s say you have a shiny new e-commerce store you just made and there is an update for a plugin you really like. You click the update button and all hell breaks loose. Suddenly your page layout is broken, 3 unrelated plugins stopped working and the return of Xander Cage is announced. If only you had a fresh backup, everything could be corrected! 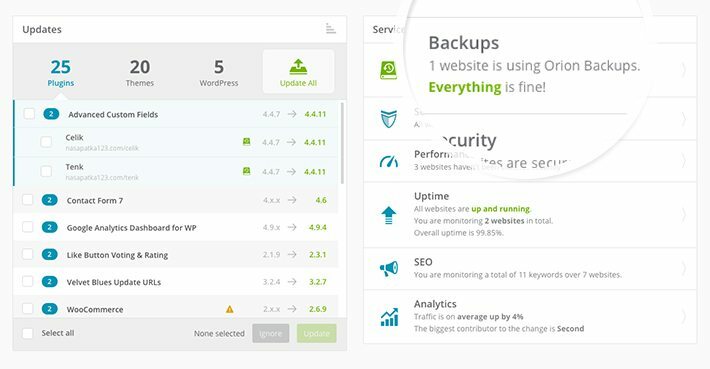 One could argue that updating, securing and backing up an existing WordPress installation is the most important thing during a websites’ lifetime. That all sounds great, but a lot of people give up best practices because managing just a single website takes more than 4 hours a week and a lot of expertise! Although it might not seem like it at first sight. Also if you are running an e-commerce website, you can lose a lot of customers and money if you experience website downtime. So, it’s key to have a quick fix solution. Do you need a WordPress concierge service? Depends. If you really want to have no worries for the rest of your days and a problem-free philosophy, then hiring a WordPress concierge service is the best option. You can be sure that all of your plugins are up-to-date, that your website is fast as a bullet and secure. It also means you don’t need to learn numerous skills, programming languages and tools needed to achieve this. You can sit back and relax. For those of you brave enough to swim the waters of WordPress website management, here are a few do’s and don’ts. Managing a website isn’t just updating your theme and plugins: it is tweaking your website’s performance, checking for security issues, managing user access etc. It is a lot of compromises: “I can backup my website every hour, but it will slow down the performance” or “I can set up this cool new payment system, but I will have some downtime due to the nature of the installation”. Don’t let any of this scare you. Managing a website for your business can be a great deal of fun and a really productive weekend hobby! Also if you have a tech savvy friend or employee, they can help you out and reduce the potential cost of hiring a professional. There are management tools that greatly reduce the time needed to manage, backup, update, secure or speed-up your website. Some of them even provide you with extra information like your websites visitors! So if you are ready to get your hands dirty, roll up your sleeves and let’s get started (it’s actually much more clicking and much less getting dirty)! 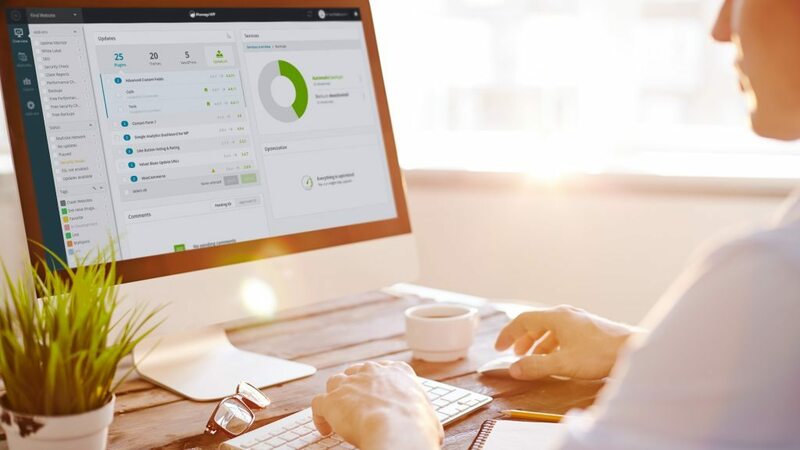 ManageWP is a WordPress management platform that takes a lot of complexity away and gives additional tools to professionals who want to step up their website management game. Let’s see how we can prevent that nasty plugin update from breaking our awesome e-commerce website. Signing up is as easy as going to ManageWP and entering your email address. 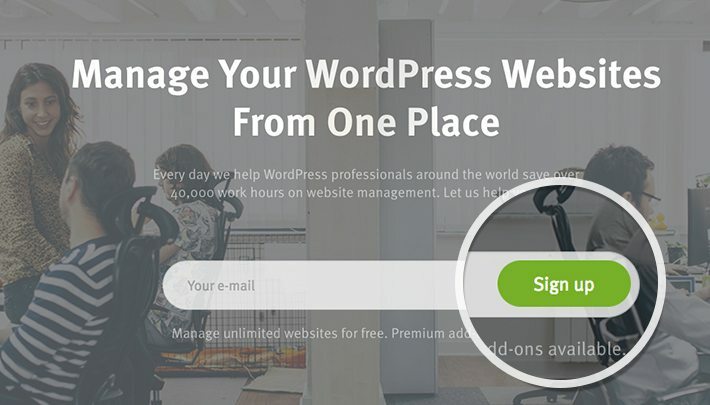 The first time you enter the ManageWP dashboard, you will be asked to connect your websites using the worker plugin. After that, you are all set up! On your single website’s dashboard go to the Backup tool in the left-hand sidebar and activate the free version. The first backup might take some time depending on your website’s size. After the initial backup is finished only files that changed since the last time will be backed up. This means that every backup after the first one is blazingly fast! 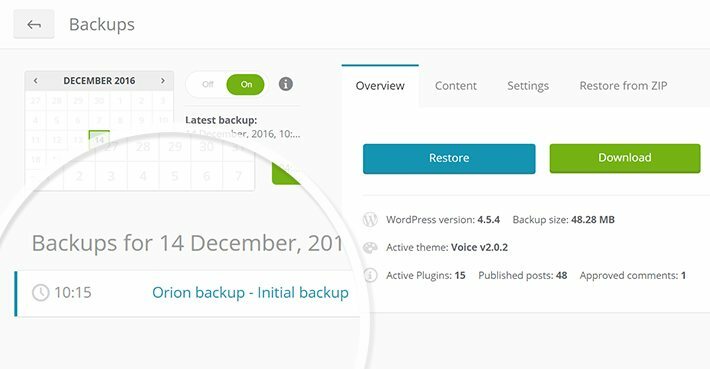 Now when you go back to your website’s dashboard and click on the plugin that you want to update, you can clearly see that you have a backup ready, so no worries if anything goes wrong. Click away without fear! Now if you try to sync our website again by clicking the refresh icon in the upper-right corner, you will get a notification that states our website is broken. But, we are prepared for this! Now when we go to the Backup tool we can see that we have a restore option available to us. Just click it and let it work its magic! In less than a minute we have a fully functioning website again and we know we shouldn’t update the plugin that has caused all of this. We are smarter by one point too. We have barely scratched the surface of what ManageWP can offer. All of these tools can help you get important information you need to make mission critical decisions when it comes to managing your website. But note: knowing all of this is just half of the battle. You need to know how to interpret this information and act on it. This is something WordPress support & management teams like the engineers at WPUP excel at. When it comes to building websites, management is often overlooked. You can use tools such as ManageWP to do some of the heavy lifting for you and give you insightful and actionable information. However, if we don’t want to spend all day managing our website, we should leave it to the professionals that we trust. Bogdan is a guy that really likes making computers do what he wants them to. Currently the resident barista at ManageWP who writes some backend code here and there. Always wanted to be a stand-up comedian, but unfortunately he is only good at the standing up part.